A Moveable Feast: La Panarda at Le Virtú. 40 Courses, 9 1/2 Hours of Abruzzo Via South Philly. “Bacchi Joe doesn’t know how to pace himself,” Fred Cretarola says, as I make this point. He’s looking across the room at several regulars who come in every Monday after playing bacchi at a nearby rec center. “I told him, I’ve got my eye on you,” Cretarola says, as the black clad waitstaff—2 male and 2 female servers— weave through the room, refilling glasses. Of course, I say yes. On the final dish of this opening stanza, I may see a wolf walking through the vines on my next sip. But, as there was between the gamberi and the brodetto of assorted shellfish, there’s another considerable gap, so I get up to visit the wine guys again, intent on telling them about my wine revelations, the unexpected realization that this dinner has become as much a plate by plate examination of a given wine as anything else. 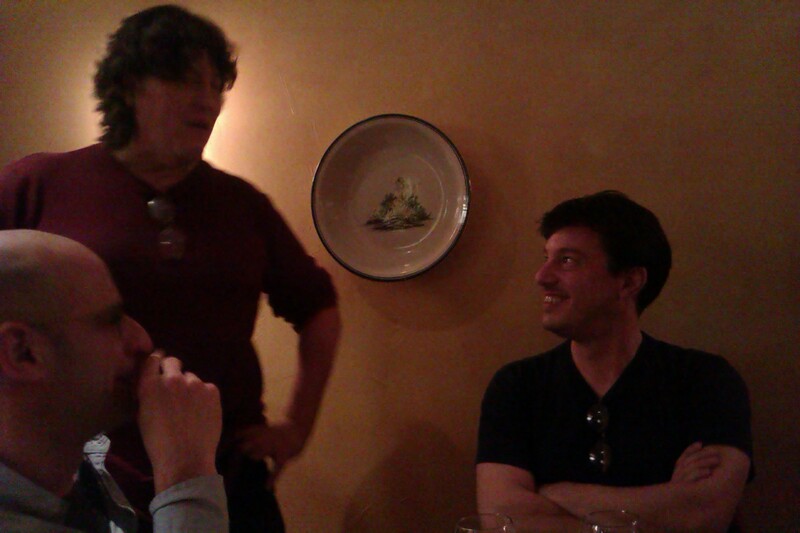 Cretarola (center) catches up with Jurdjevic (right) as Scott looks on. “There’s definitely not a single dish that goes with a single wine,” Dall’Olmo says. “Wines are versatile,” he says, with the menu underscoring that point. “In theory what a wine should do [at the least] is cleanse the palate and not overpower the food. The opposite example, where the food doesn’t go well, would be pizza dough—that and any baked goods can kill the flavor of the wine. Then, you’ll just be left with alcohol. For this [indicating the Cococciola], I’d pick a soft, creamy cheese. Young. Nothing heavy or stinky—maybe just a tinge in that direction,” he says. Then I get up again to talk to Francis off by the corner of the bar. When I ask him about the mystique of the Abruzzi, he again mentions the Boccacio quote—Piu la’ che Abruzzi—to illustrate how it’s always been viewed as a singular place, a wilderness that defies delineation as much as it remains untamed. “That’s very true of Abruzzo,” he says, before speaking of Abruzzo’s near mythical men of the mountains. He mentions Majella National Park—one of several parks full of villages and wildlife in Abruzzo, he says—which features many caves of bygone religious hermits, the caves being close to where infamous brigante took to the mountains to “oppose what they deemed an imposition by the Piedmontese and The Papal States” following a period of Spanish influence in the north during which the impoverished South was left isolated. With the ten-year push toward unification that began in 1861, there was a high degree of resentment for taxes imposed by Italy’s new “king.” So, these “doomed Robin Hood figures,” as Cretarola calls them, took to the mountains to resist what they saw as unjust governance, with women eventually joining the ranks of the brigante—a rarity Cretarola says for such a macho, male dominated society. This just adds to my growing fascination for the Abruzzi, a place whose history and terrain seems so inextricably interwoven with its people. Our talk drifts back to the dinner itself, with Cretarola saying that in some ways, this dinner is much easier for them to do then say, a busy Friday night, which entails constantly turning covers. Even though they’re a bit overbooked he says, it beats managing a room where people are getting up and sitting down at different times throughout the night. Which sets off an alarm telling me I’ve been away for too long—l’ve missed a course! Thankfully, a waiter tracks down an extra baccala umido. Besides the fact that I’m intent on finishing every plate, the dish rails against the limited vocabulary we have for the versatility of fish, with the light salt and buttery notes of cod helping to bring out the sweetness of tomato, which springs off the accompanying salinity of olives. We found you! Best of luck with the blog. See you on March 4. Haha. Thanks for reading. See you both at the dinner on the 4th, which, sadly, will only include 15 courses and will only run for 2 hours (all for $25!). Brion, Great writeup! The lockout is over… yay!